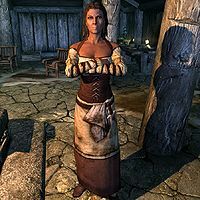 Valga Vinicia is an Imperial and publican of the Dead Man's Drink in Falkreath. She has 100 gold available to barter with and buys food. She wears a set of barkeep clothes and a pair of shoes. She is equipped with an iron dagger, and carries a key to the inn as well as a selection of common loot and gold. When you talk to her she will greet you with, "Welcome to Dead Man's Drink." Talking to her further will cause her to reveal some details about her rather eventful life, saying, "I escaped fighting in Cyrodiil only to have it track me down again in Skyrim. ", "In Falkreath if I don't know it, it's not worth knowing. ", and "I wouldn't complain if we could string together a few sunny days now and then." When you ask her where you can learn more about magic, she'll say, "The people of Skyrim don't like magic much, so about the only place you're likely to find a teacher is the College of Winterhold." When exiting conversation, she'll say, "You hear any juicy gossip in town, be sure to share it with me!" or "I'll be right here if you need anything else." Valga belongs to the food vendor class, which determines the level of her skills. Sometimes entering Dead Man's Drink will cause her to say "You need to leave" however no bounty is acquired if you stay for too long but she'll repeat it endlessly. ? Talking to her or loading a save game after entering or leaving the inn and entering again will prevent this, however leaving Falkreath for too long and returning again will result in the same issue. Repeating the same procedure (talking, leaving and reentering or reloading a save) will prevent this again. This page was last modified on 18 January 2017, at 06:31.